I absolutely love everything below the waves…the creatures, the treasures, the colors. Growing up, all of my birthday parties would be somehow sea related and I even had an ocean-themed bedroom! See my boys’ Ocean-Themed Birthday Party and their Aquarium Cake! My boys have grown to have the same fascination as me and I absolutely love it. We always make a point to visit aquariums and have even done behind-the-scenes tours and visited SeaWorld! We’ve touched stingrays, I’ve swam with sharks, and we even set up a saltwater tank of our own (unfortunately we are down to one fish as of a few days after I worked on this printable featuring our clownfish, Nemo.). We are obsessed. Funny story–I am actually pretty scared of the ocean itself and have all but forgotten how to swim, but I always wanted to grow up to be a marine biologist. The ocean is just such a marvelous piece of Creation! 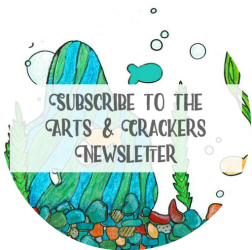 I have created this fun ocean scene coloring page for you to color and hope to finish a paid packet in the near future (we have been so busy with our playroom makeover and prepping for my upcoming press trip, I totally forgot to finish them!). In the meantime, check out my store for more. Enjoy this adult coloring page and let your imagination swim free. As you color, explore the ocean floor and find hidden treasures! I have subtly hidden 6 treasures in this busy reef. For my coloring page, I used a combination of art markers and art pencils. I absolutely love how it turned out! My boys want this framed and hung in their playroom closet (I have a fun tutorial idea in mind for that room, if all goes well–if you love the ocean you’ll want to follow along with my blog to see how it turns out!). Remember I am coming out with a coloring page? I know, I know, I am being so very pokey on that. Sometimes life happens. I am at the point where I am working on the finer details between all my other tasks (the cover, logistics, etc.) and hope to launch within the next couple months. Fingers crossed! This page balances just the right of detail. There is not so much that it is overwhelming, but not so little that you become bored. I have left plenty of room for practicing your techniques and even adding some of your own details! Notice how I did a multi-color seahorse, patches of color on the ocean floor, and used a lot of shading. I even added some white streaks/sunbeams coming from the waves at the top by using a combination of an art eraser and a white piece of chalk. My white pencil is very old and was not working well for this, but I plan to get one of these markers and one of these erasers soon to make the white detail more noticeable, especially over the marker areas. I did not use a whole bunch of mediums on this one, so I achieved the vivid colors by a bunch of layering (including layering pencil over marker and vice versa!). Tip: Since this is the ocean, give everything a light blue tint! You can do this either by choosing all colors with a bluish tint/base, or you can do what I did and add a very light layer of blue over everything after it was colored in. It makes the coloring page come alive! A pop-up window will show; scroll down with the scroll bars or with the page down or down arrow buttons on your keyboard to download. Dive into this coloring page and use your imagination and creativity to make this coral reef come to life. And hey, why not use the ripple effect and create some waves by sharing this post with some friends?! 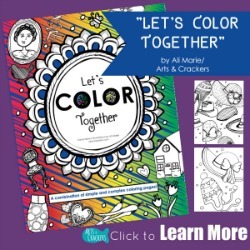 Do you love to color? What is your favorite art tool for coloring–pencils, markers, watercolor, something else? Share with me in the comments! I’d love to hear what products you use and why you love them! adult coloring pages, coloring, ColoringTribe, fish, ocean, printables. Bookmark. I really love this coloring page, I think it would be fun to color. It’s neat that you have hidden treasures in the picture.